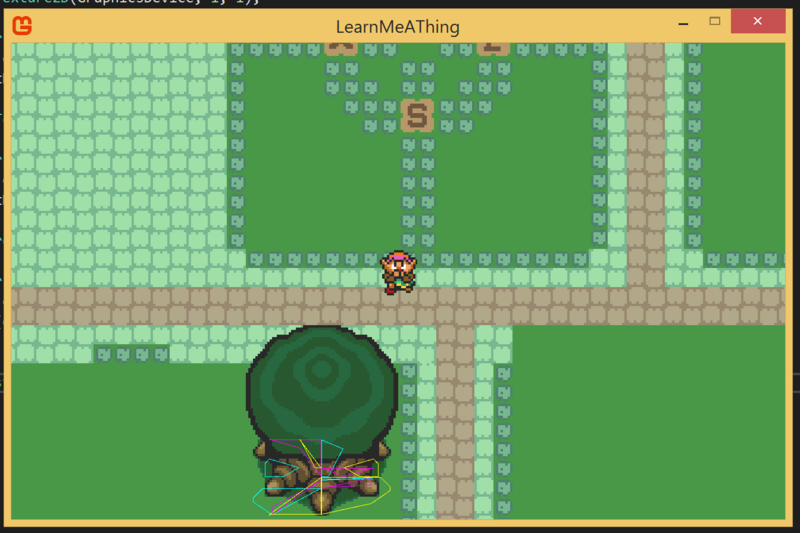 Yesterday I decided to basically start over on the debug overlay. I’ll keep some of the infrastructure (calls, types, line drawing code, and so on), but everything else needs to go. Bounding boxes! These boxes are based on screen positions and sprites, not hit maps. It’s a good exercise to know that I can translate those simple things into the debug overlay. Now I’m going to make a smaller test collision object that’s simpler than the tree, and see if I can’t get it working. I’ve now got a layer that renders the bounding boxes of the hitmaps, as well as the simple object (which is a “tie”) I mentioned earlier. As we can see, things are kind of jacked. 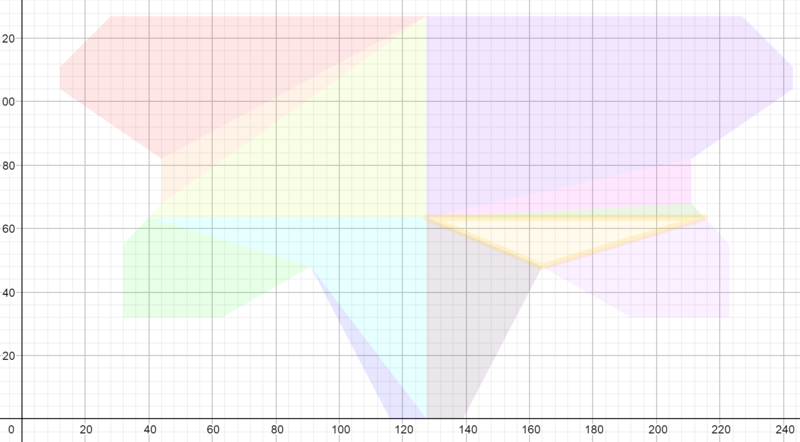 In particular the y-axis appears to be messed up on hitmap loading; if you look closely, even the triangles are weird. Given that only the squares are working, I strongly suspect the issue is when there’s a gap between the hitmap and the edges of the sprite that uses it. I found a couple bugs: one in the loading of hitmaps that accounted for the distortion (just dividing by the wrong value to get y coordinates), and one in positioning hitmaps (somewhat more complicated, but my translation from screen locations to cartesian points was incorrect). 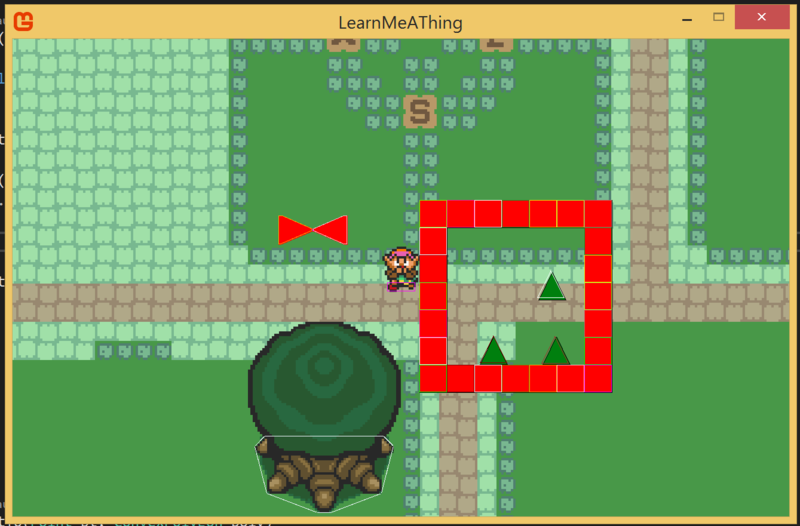 So now hit maps are positioned correctly (they sometimes lag the triangles because the hit maps are from before any pushing happens on a frame), and you can even see the triangles are imposing the correct boundaries. Not quite done with the debug overlay yet, still need to actually render the hitmap not just it’s bounding box. the tree is still messed up. 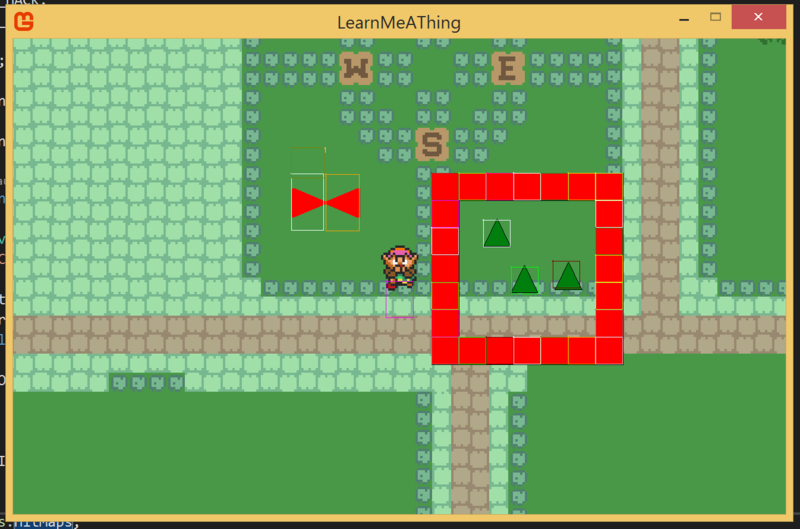 Switching to just a convex polygon for the tree “works,” which suggests something with the polygon decomposition. Which I thought I had eliminated as a source of errors, but here we are. Yet more digging! While I haven’t quite explained what’s going on entirely, I have found an odd result in the decomposition – some polygons are overlapping, which shouldn’t be possible. I’ve verified that the naive splits work fine, so it’s got to be something in the exhaustive search. I’m working through all the little details to try and find what I got wrong, my gut is telling me it’s either the “can see”-test or the partitioning. I think all developers can relate to the “wait, I already know this works… oh wait, it’s busted”-feeling I’ve got right now. Back to the bug mines. Of course, things are still broken in the actual overlay so I’m not out of the mines yet. I’ve confirmed that the collision system “sees” those errant polygons where they’re visible, so again I’m thinking it’s a bug with how I’m positioning multiple hitmaps for a component with more than one.